A member of the MLB All-Century and All-Time Teams, Ted Williams was inducted into the National Baseball Hall of Fame in 1966 on the first ballot. Williams is a two-time American League MVP and Triple Crown winner, a 19-time All-Star and a six-time AL batting champion. 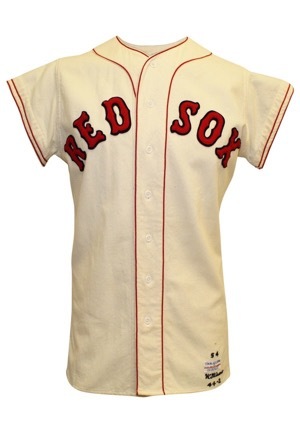 Offered is an incredible Ted Williams game-used jersey from the 1954 season in fantastic condition with perfect lineage. 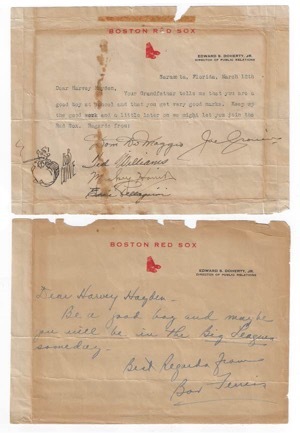 Our consignors grandfather owned and operated a garage one block from Fenway Park called Harvey Sales & Service. During the 1940s and 1950s he became a good friend of Joe Cronin and befriended many of the Red Sox players as well as the clubhouse manager, Johnny Orlando. 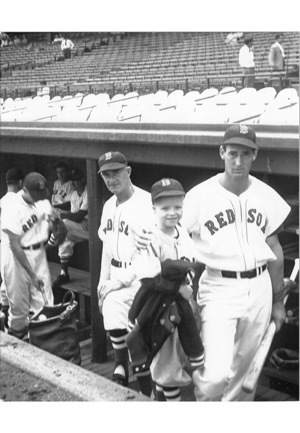 In 1950 Johnny Orlando invited the pair to hang out in Fenway for the day. This was when Ted broke his elbow in the All Star Game and he was back at Fenway for treatment. Williams invited our young consignor to sit next to him at his locker while he asked about school and his grades. "He told me to work hard in school, get good grades, and someday I might be playing for the Red Sox. We spent about 15 minutes together." Over the years the team would check up on me even having me send my report cards to the club and they would sign them, circling the As and crossing out the Bs. 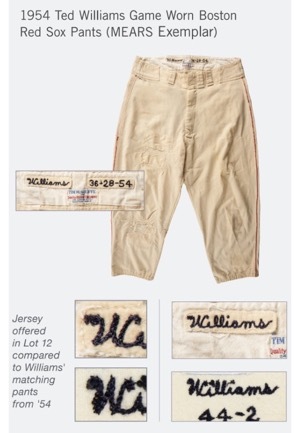 A few years later my grandfather presented me with this Ted Williams game-used uniform, which Ted had customized to fit my teenage frame. On the front left tail is the McAuliffe manufacturer’s tag. 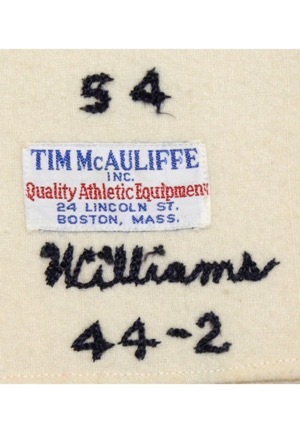 Adjacent above is the year “54” and adjacent below is “Williams 44-2” done in black chain stitching. 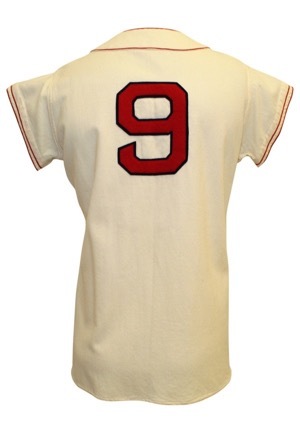 Across the front is “RED SOX” and across the back is the player number “9”. All numbering and lettering is done in red on navy blue felt. 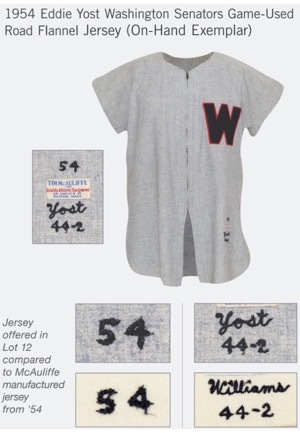 A truly unique Williams game-used jersey with a custom tailored fit for a close friend. This jersey is properly tagged, was presented to us as game-used and in our opinion shows appropriate use. Accompanied by a LOA from our consignor detailing his grandfather’s history befriending Williams and how he received the jersey directly from Williams.